By and large; the digital divide refers to inequality in access to, or ability to use, information and communication technologies. Such a divide may exist between populations and geographic areas in a given country or between countries. 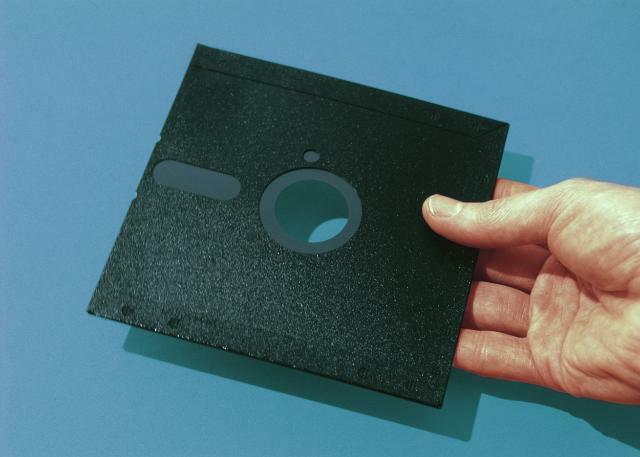 The global digital divide often refers to the fact that the internet has not spread evenly throughout the world. Such is the case with Africa which is the world’s region with the lowest internet penetration rate. While some African countries have narrowed this gap in recent years, such as Kenya that has an internet penetration rate (% of population) of 47.3%, other African countries still lag behind the rest of the world. These include the Ivory Coast (4.2% penetration), Eritrea (5.9%), Ethiopia (1.9%), Rwanda (9.0%). As a whole, Africa has a penetration rate of 26.5% as opposed to Europe’s 70.5% and North America’s 87.7%. However, there seems to be one area in which the digital divide between Africa and the world in narrowing, that of digital diplomacy. Nowadays, more and more African foreign ministries (MFAs) are embracing the internet & social media and using them as tools for the achievement of foreign policy goals. 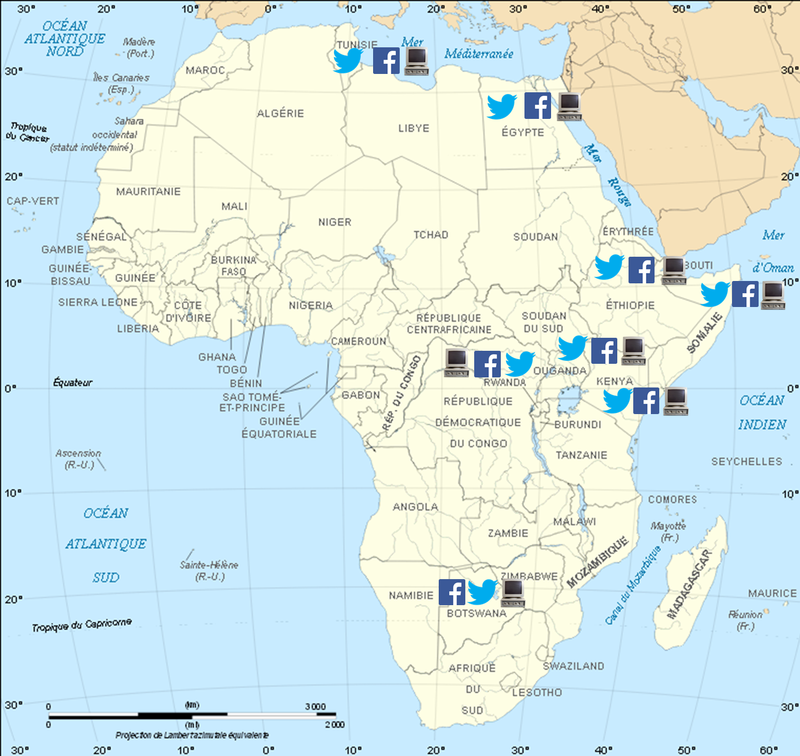 My analysis of a sample of African MFAs, which can be seen in the image below, demonstrates that like twitter’s bird, social media seems to be migrating across the African continent. As can be seen in the map above, while Rwanda and Ethiopia have very low internet penetration rates, their MFAs operate websites, Facebook profiles and twitter channels. In fact, there seems to be an increase in the amount of African MFAs that are active on all three platforms as can be seen in the map below. Of course simply being active on social media does not mean that a country practices digital diplomacy. In order to practice this novel form of diplomacy, one must first attract audiences to his social media accounts. Some African countries have been able to do just that. Ethiopia’s MFA has 34.6k followers on twitter while Kenya’s MFA attracts 52.8k followers and Rwanda’s MFA has an audience base of 16k followers. Yet what best illustrates the narrowing of the digital divide is the manner in which African nations use social media when compared to countries from other world regions. In a study soon to be published (I hope) I compared the digital diplomacy activity of 11 MFAs over a two months period. The sample included the following MFAs: Israel, USA, UK, Poland, Japan, S. Korea, India, Ethiopia, Kenya, Somalia and Rwanda. 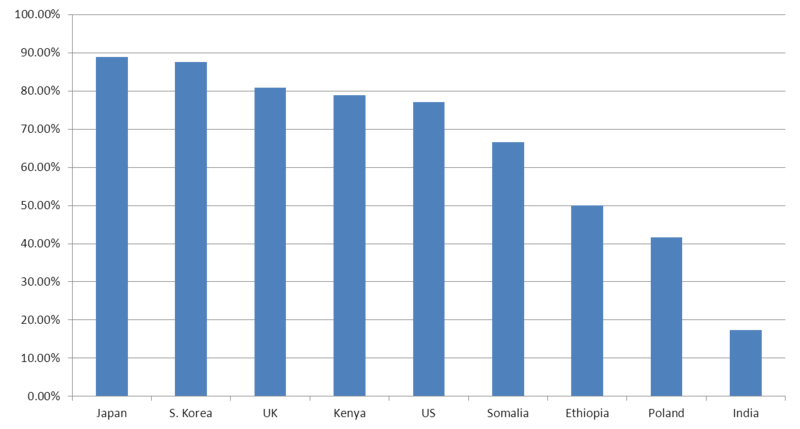 The first parameter I evaluated was frequency of use of social media channels. 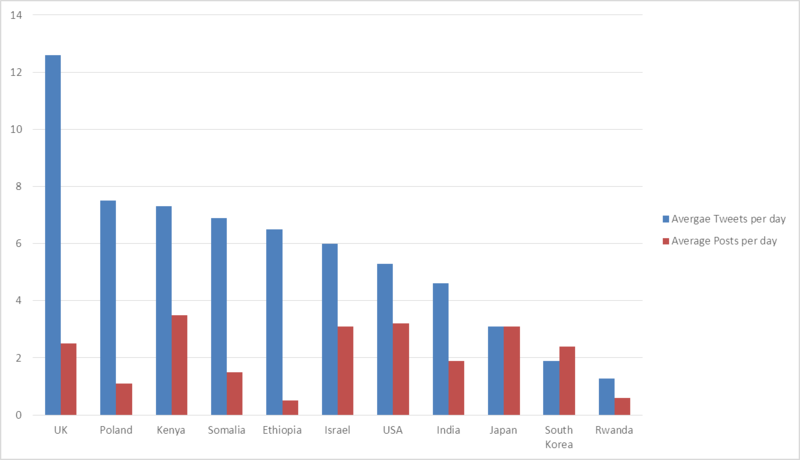 As can be seen in the graph below, African countries such as Kenya, Somalia and Ethiopia are among the most active MFAs in this sample coming ahead of Israel, the US and Asian countries. Next, I compared levels of engagement. As a whole, engagement seems to be a rarity among MFAs in this sample with the exclusion of Israel, Kenya and the US. Among MFAs that do practice engagement, Kenya is second only to Israel and exhibits higher levels of engagement than the US State Department. While exploring these MFAs’ use of digital diplomacy I found that many ministries use both twitter and Facebook to disseminate the same information. I therefore calculated a congruence score for each MFA. The lower one’s congruence score, the greater the diversity of content he shares on twitter and Facebook. 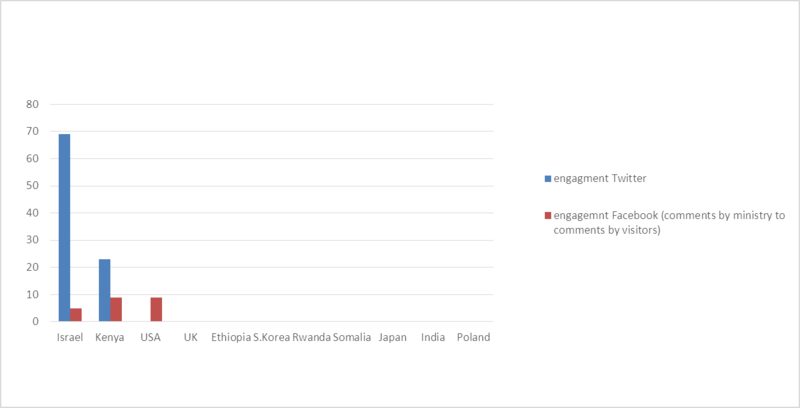 The results of this analysis, shown in the graph below, revealed that Somalia and Ethiopia have relatively low congruence scores indicating that they not only use social media, but offer their followers unique content on each medium. 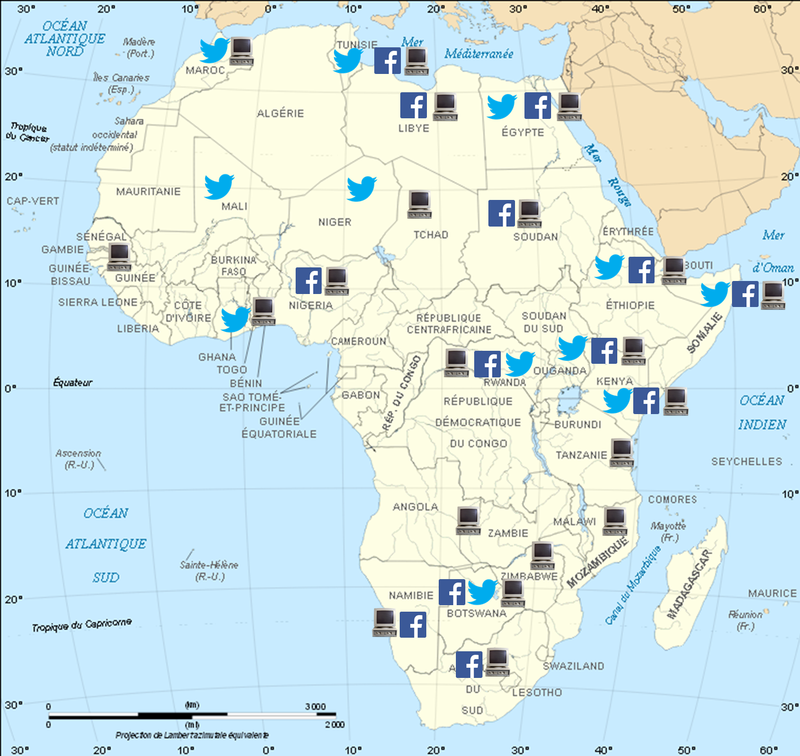 The results of this analysis suggest that some African MFAs are as active on social media as their Western peers. Moreover, African MFAs often exhibit a more savvy use of digital diplomacy than their peers in terms of diversity of content and engagement. In this sense, it is possible that the digital divide is narrowing in the field of digital diplomacy. There is, however, on important limitation to African digital diplomacy. As social media has low penetration rates in these countries, MFAs may not be able to converse and engage with their own citizenry, a form of engagement that is at the heart of diplomacy in the 21st century. Next week I shall continue exploring this topic through an evaluation of African missions to the UN and African foreign ministers. Until then, you can tweet me @Ilan_Manor. Posted in Uncategorized and tagged Africa, Digital Diplomacy, digital divide, Ethiopia, Facebook, foreign ministry, Kenya, MFA, Somalia, twiplomacy, Twitter. Bookmark the permalink.